We do a lot of cooking at home, in part because M's sense of adventure is not capable of sustaining eating out at Japanese restaurants every night. But after recharging on American food at Thanksgiving, we made this week "Japanese cooking week" at home. We looked up a variety of Japanese recipes and put together a few treats. Monday was tofu in a homemade teriyaki sauce (which was so beautiful that L nearly cried when she first saw it -- though that was probably because she didn't get home until 11:30 pm and she hadn't eaten all day), chestnut rice (I had never seen a real roasted chestnut until coming here to Japan, where they are an autumn delicacy), and the homemade gyoza shown here. I made up the recipe for the filling, but based the procedure for making these Japanese 'potstickers' on an article I read. It explained "why the gyoza that most Japanese houswives make are never as good as the gyoza restaurants." Let's just say that M is not your typical Japanese housewife because these gyoza were wonderful! Weather in Tokyo is still quite fine, usually above 10-15 degrees C and about half of the days sunny. M snapped this photo of a Japanese family having a Saturday picnic at a park about 3 minutes from our apartment. The kid is actually using the camera on his Japanese cell phone to take photos of a pink ball that he throws up in the air. His father took photos of this spectacle on his cell phone camera, so I decided to snap a photo of the whole sequence using mine. These tiny portable cameras certainly have changed the way we see the world. We had a small celebration for Thanksgiving. Japan actually celebrates a holiday on November 23 each year called "Labor Thanksgiving." This year, it happened to fall on America's Thanksgiving Day. M had a holiday from work, but L had to clock in like usual (darn satellite never sleeps). She was lucky enough to come home "early" so that we and a few of her coworkers could go to an 8:30 pm Thanksgiving dinner. Since turkey is nowhere to be found in the grocery stores, Hilton had a big Thanksgiving buffet with all of the traditional favorites: roast turkey, stuffing, cranberry sauce, and seafood "jelly." The last one was actually a Jello product with suspended sea creatures, and may not have been as common at your family's Thanksgiving table... or mine. But it was a fantastic spread of food and despite my joke about the few Japanese treats, it was a real Thanksgiving dinner. Fall is a very important time of year in Japan because of "koyo" -- the changing colors of autumn leaves. Having never lived in an area with four distinct seasons, M was ecstatic about the opportunity to experience one of the best leaf-watching sites in the world. We hopped a train to Hakone last weekend where the leaves are particularly famous. The trip involves many steps. First, there is 1.5 hour train ride to get outside of Tokyo. Then we made our steep ascent from into the mountains by a train that had to stop every few minutes to turn around and head up a switchback (the direction change took place at gorgeous overlooks, giving us enough time to snap pictures like the one on the left), a cable car, and a spectacular ride on a ski-resort-like tram above the forest leaves. We also had the chance to wander around and take short walks in between each transit mode. The only downside was that it was a bit cold and rainy, but that had the benefit of keeping the crowds away. It turns out that Hakone is actually the remains of a blow-out volcano (a caldera like Crater Lake). It had a huge explosion about 3000 years ago and still has vibrant hot spring activity. We could hear the hissing as steam vented from cracks along a scenic walkway. Ever industrious, the Japanese harness the power of the earth...to extract money from the hoards of tourists. They sell black eggs that roasted in the hot spring, and we were told that everyone must taste them (sold only in packages of 5). Piles of blackened egg shells littered the ground outside the "tea house" adjacent to the hot spring (misnamed because it only seemed to sell tourist eggs but no tea). They were quite good, and well appreciated as a warm treat on a gloomy weather day. We made it back down the hill after sunset, pleased to have been lucky enough to experience some of the world's finest leaf color at peak season! The Hinode satellite is taking excellent pictures. In the one on the left, you can see the planet Mercury about to cross in front of the Sun (click on the image on the left for a NASA news story). L's work hosted a party to celebrate the early successes in the mission and we both attended the reception. It was a lot like many of the other receptions we've been to thus far with several speeches and lots of sushi. There were some differences, though. The vice president of JAXA (Japanese space agency) asked to meet some of the young scientists working on the project and so he talked with L for quite some time about her experience. The most unique aspect of the party was that it ended at 8:30 pm and then everyone went back to work for several more hours. I'm told that the tsunami warning last week got a lot of press back in the US. It was also a big deal to us in Japan. I snapped these two photos of our TV set -- the warning was showing simultaneously on ALL the TV stations. The photo on the left was NHK, the public television channel. It devoted its full coverage to the tsunami warning (red) and watch (yellow). The earthquake was an 8.1 that hit just off the TV screen on the right. The photo on the right shows the identical tsunami warning map on the right side of the screen without interrupting its regularly scheduled teen breakdancing program. L finally got an afternoon off from her busy work schedule and we decided to go stop and smell the roses, literally. We headed to New Otani garden, a small but perfectly manicured and pleasantly designed Japanese garden. We ambled along its pathways, pondered the zen garden, admired the fish in the pond, examined the rocks, and watched a few little girls dressed in kimonos hopping across the stepping stone bridges. After the garden, we headed up to the Mori Art museum on the 53rd floor of a skyscraper. Not only did it have an innovative exhibit involving video and sound, it also hosts an observation deck with nearly 360 degree views. The day was so clear that we caught the view of Mt. Fuji at sunset. We sat there by the window talking until Fuji eventually faded off into the darkness. Overall, it was an idyllic afternoon. Click here to go through all photos from our afternoon. I originally thought these bottles of water near the curb were some sort of disaster preparedness. After all, Japan is very good at such preparations and we were told to make sure to have three days of water on hand in the event of an earthquake. However, when I asked Japanese friends they told me that the bottles are to keep cats away from the building. Yes, cats. I asked, "do they work?" I'm not sure I ever got a clear answer. One of our loyal blog readers actually took us up on our offer to visit us and take advantage of our spare couch space! One of L's former colleagues from Berkeley came to Japan for a conference. What's even more amazing is that the very same weekend, another one of our friends from Berkeley came to Japan for a different conference. We visited Hachiko the dog's statue (click on his picture above to read a story about him). Then we went to the Tokyo Tobacco and Salt Museum, including its special exhibit on Tequila (no, I have no idea how this relates to Japan). To make sure that we gave them at least some taste of Japan, we went to the Toguri museum of art which houses an astonishingly large collection of Japanese porcelin. They have over 7000 pieces, but only display a few at a time. Highlights included the exhibit showing the procedure for making those beautifully colored Japanese vases using a technique borrowed from the Chinese around 1600. We rushed over to catch a brief performance of "dances" at the kabuki theater, which included a sword fight scene between a famous Japanese kabuki actor and his real life seven-year-old son -- very cute. We ended the day with dinner at a Japanese restaurant that serves organic produce -- what a fitting way to end a great day with friends from Berkeley! Later this week, two of M's former USGS colleagues visit Tokyo for a conference at the Earthquake Research Institute where he works. When it rains, it pours! But, we're dancing in the rain having all of these friends visit us, and we hope that more of you will have the opportunity to see us as well. M traveled south to his third Japanese island, Shikoku, for a conference (Japan has four major islands and many smaller ones). More about the conference in a future post, but the train ride down had a special surprise. We came around a corner and I looked out the window to find the most perfectly shaped, snow capped mountain glistening in the sun -- Fuji san. It was one of the most perfectly clear days since we have been in Japan, so it was quite a treat! Quickly reaching for my cell phone camera, I was able to snap this shot. Within a few minutes, I also emailed it to L who could not join me on the trip because she was too busy working. At least that way, we could share some of the adventure together. The train also passed the interesting Solar Arc building, a museum devoted to solar energy. M was part of the US delegation to the joint US-Japan panel on earthquake research. It was a meeting attended by about 25 scientists from each side and jointly sponsored by the US and Japanese governments. We were sent an email by our Japanese hosts informing us that unlike typical scientific meetings, we should wear suits because of the events' important role to the Japanese government. The meeting was conducted entirely in English, with all of the Japanese in attendence having a surprisingly strong command of the language while most of the US delegation mangled the pronounciation of even the simplest "arigato." It was actually an extremely successful meeting. Some amazing new results were presented by both sides -- with fascinating new observations of how dynamic and changing earthquake faults can be. We learned about "short-term slow slip events," "long-term slow slip events", "very low frequency earthquakes", "non-volcanic tremor," and other invented names for different types of slow movement on faults. We always thought these faults were locked tight, but now our instruments are sensitive enough to see details that we never knew were there. The presentations by both sides were very clear and it was obvious that everyone put a lot of effort into their talks -- perhaps more than most scientific meetings. My presentation was very stressful because I am just starting a new project and was racing to have good results to show. I was working on running computer simulations up until the morning of my 8:45 am presentation! It went alright, but I was a bit nervous because the project is still new and I don't understand as much about it as I would have liked. The photos above show one of the fancy receptions we had. A government minister is speaking at the podium. After the closing ceremony for the conference, we went to have a fun night on the town. The local community center has weekly performance of a very old local folk dance. Apparently, this style started in the 1500's as a victory celebration style after this town successfully overcame some invaders. Quite a few of our Japanese hosts came along, saying that they had heard about this dance but had never seen it before. The dance is done to a catchy tune played on bamboo flute, drums, and three-string guitar like Geishas are known to play. It was fantastically fun to watch. They even taught us how to do it, though I was absolutely awful! They gave a prize to the best dancer in the audience. It turned out that the winner turned out to be a local from the town. See a short video clip of the men and the women. Our conference delegation took a trip to the southern coast of Shikoku, which is hit by devastating tsunamis every hundred years or so. Waves of up to 90 feet have been observed here and the town we visited has basically been completely wiped off the map each time the tsunami hits. We got a VIP tour, escorted by the mayor (picture on right) with most of the presentation led by the director of a local museum and a number of survivors of the 1946 tsunami. They have done a lot to prepare for the next tsunami, including building special tall, strong buildings for tsunami shelters near the beach, clearly marking evacuation routes to high ground, and building an $80 million breakwater offshore to diminish the tsunami's effects (picture on left). All this in a town with only a few thousand people. Most striking, however, were the dozen or so tsunami monuments we saw scattered throughout the town. These were placed after each tsunami (stretching back almost 400 years) with inscriptions describing the catastrophe and warning future generations. They were clearly an awareness among the town's residents of all ages. Last night we participated in another authentic Japanese ritual: lock yourself in a booth with a few drinks, two microphones, and some cheesy American pop music blaring on the speakers. Karaoke in Japan is huge. Every little town has a karaoke bar or three. We went to Shinjuku where the first 7-story karaoke building we tried had a 30 minute wait. You get your own booth (actually a room) and a computer terminal with a healthy selection of iconic American and Japanese (J-pop) tunes. Somehow the audio recording of our performance was "lost" by our technical staff. If you want to hear our stunning voices for yourself, you'll just have to come visit us in our local karaoke parlor here in Japan. Suffice it to say, we had a great time. Every few days, our landlord, Takahashi-san, changes the flower outside our front door. That way, we always get to have something beautiful in bloom when we come home at the end of a long day. "First Light" is the term they use in the telescope business to indicate the instrument's first pictures. 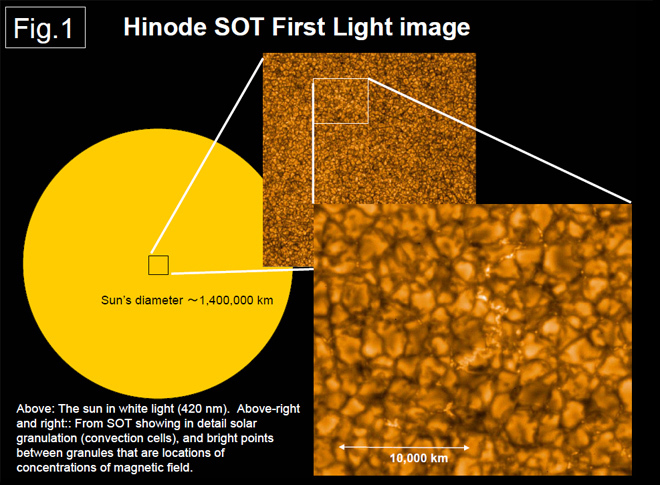 Hinode, L's satellite, just announced its first light. The picture on the left is the instrument that L operates (click on it to zoom in). Look at how some parts of the sun are really bright and some are much darker. Her instrument, XRT, takes pictures in X-rays. The Sun emits a whole lot of energy in X-ray, but Earth's atmosphere blocks most of it out so that we are protected. That means pictures like hers can only be taken out in space. The picture in the middle is a super-zoomed image of the Sun's surface in plain old visible light. If it didn't burn your eyes, you would see something like this by looking through a really, really good telescope. So next time you look up in the sky at what appears to be a really bright dot, remember all the complexity and beauty of the shiny orb. L's team is very excited to release these first images. There were quite a few glitches and problems getting to this point, so it feels really good to show that the satellite can actually take sharp, beautiful pictures. NASA and everyone else is also very excited. The photo even made it to the front page of Yahoo!-Japan, where there is only room for one picture from the news at a time. See a snapshot of the web page. The big story in the news here is still North Korea. But, another story is a suprisingly close second: a scandal over schools. Japan has a national curriculum with certain subjects required for graduation. It's similar to US standards based teaching but a bit more prescribed. It was recently discovered that a large number of high schools were ignoring some required classes in favor of spending more time on subjects important for college entry exams, which make the SAT look like a pop quiz cake walk. These are the exams that students study hours a day for and visit certain local shrines to write prayers during exam season. The scandal gets worse because a number of schools actually falsified student records for both governmental reports and students' transcripts for university admissions. This is pretty major with almost 300 schools and 50,000 students affected this year. One school principal has even committed suicide in response. The government does not look like it will be flexible, meaning many of the graduating seniors will have to take hundreds of hours of extra alpser before the end of the year, even though it was the schools that violated the rules and not the students. Listen to a 5 minute NPR story on Japan's university entrance exams. Our apartment here in Japan is probably one of the nicest that we have ever had -- and we've been sampling quite a few in the last few months. Read here to find out more. Apartment sizes in Japan are measured in "mats" -- as in tatami mats. Our apartment is about 34 mats, or about 580 square feet. That may not sound large, but it's actually bigger than the apartment we had in Washington DC and about 3 times the size of many of the other apartments here in Japan. Since we don't have a huge amount of stuff with us here in Japan, it's actually quite comfortable and spacious. The centerpiece of our apartment is clearly its Japanese-style room. It has a tatami mat floor (made out of straw). We have a low table called a kotatsu with a built in heater and we sit around it on small cushions called zabutons. The room has rice paper screens on huge windows looking out to the neighborhood. We also sleep in this room. Each morning, we roll up our futon and place it in a closet specially designed for storing futons (well, some mornings we don't quite have time to do it). It's actually quite comfortable. The apartment also has the wonderful smell of the tatami (kind of like fresh cut hay). We have a small kitchen with wood floor and a kitchen table that folds out to seat six. Counter space is pretty limited, but we do a lot of cooking sitting at the table. Japanese apartments do not get rented with appliances, so we had to get our own refrigerator, stove, and washing machine. The first refrigerator we selected was too large to fit in the door, so we had to exchange it for a slightly smaller model. It's short enough that we place our microwave oven on top of the fridge to save space (common in Japan). More about cooking in a future entry. We have a small office with a desk, couch, and recliner. The room also has the only western style closet in the house, so we also store our clothes in here. L's work provides her with a fancy computer (including a HUGE monitor) so that she can work more effectively from home. The couch is small, but also did not fit in the door. It was light enough that the furniture people could lift it through one of the apartment's large windows, which was quite exciting to watch. I promise a future blog entry devoted to Japanese bathrooms, especially the very high-tech toilet technology. For now, just know that our bathroom is a bit on the small side. It has a deep tub with a nice shower head. This map shows up on computer screens on my floor when the Japanese seismic network records an earthquake. The countdown (8 seconds left in this photo) tells you the amount of time until the most intense S-waves will arrive at the building. I saw this magnitude 3.5 earthquake when passing by on my way home from work the other day. This quake turned out to be too small and too far away for me to feel it.